Ever sit through a painful presentation? Whether you needed sunglasses to avoid the "glare" of the graphics, the presenter rambled, stumbled or droned on -- or read the slide text word for word -- chances are you left the room with few if any takeaways. Don't risk your target audience feeling this way! To ensure your presentations don't leave attendees wishing they were anywhere else, you need to prepare for your audience. While there is no rule of thumb or one-size-fits-all solution, there are standard practices for bringing presentations to life. Have you considered the tool you will be using to create your presentation? You have many options, such as PowerPoint, Prezi, Brainshark, Kingsoft or Haiku. If a group of people will be working on your presentation, you may want to consider an online tool like Google Slides, so multiple people can work on it at the same time. In this free ebook, you'll learn the best ways to plan and develop your presentation; the importance of content and quality graphics; how pace impacts your audience's reaction; and more. All of these elements play an integral role in creating and delivering effective presentations that leave your audience saying, "Wow!". 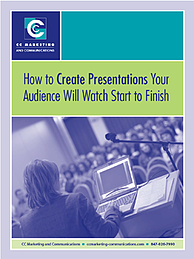 Download How to Create Presentations Your Audience Will Watch Start to Finish to learn how to create presentations that make an impact with your audience. How to Create Presentations Your Audience Will Watch Start to Finish is full of practical ideas for ensuring your next presentation generates the response and outcome you seek. Download it today!